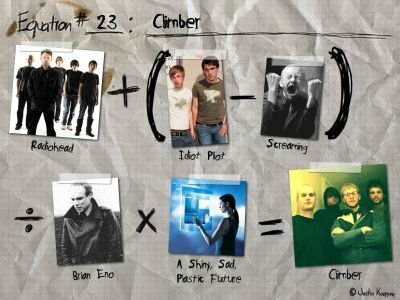 Portland band Climber are one of the best local bands I've ever seen, and I don't think it's because I'm a huge Radiohead fan either. Standing there in some tiny bar watching these four young guys make this exciting, delicate, orchestral music is as stupifying as it is breath-taking. I may sound like I'm gushing, and perhaps I am a bit. When I first heard some of their free tracks from their website I thought, "this is the kind of music I've been looking for for a long time", it's complex, interesting, melodic and emotional in a "these-thoughts-came-to-me-on-Ritalin" kind of way. It's difficult to pin them down right now, their 6 track EP that came out in 04 is more subdued and simple than their anthemic and vivacious newer material. You can hear the difference yourself by previewing tracks on their website. Compare the older "Foxes" with the more recent "Bugbear", their current radio single. If the new tracks are any indication of their as yet unmentioned full album I see Climber being propelled nationwide in a very short time and with the amount of time they've spent refining their skill and sound the definitely deserve it.